Kosherfrugal.com - Frugal Living in Israel: Kosherfrugal.com's ebay Deal of the Day! Kosherfrugal.com's ebay Deal of the Day! Still trying to reign in your spending, but not sure how to do it? I'm begun posting ebay deals here, and plan to continue on a regular basis, that will help bring costs down. Today's deal is PERFECT for the frugal bakers out there who like to make things from scratch! Vanilla Beans - you just score them with a sharp knife and toss these into a bottle of vodka, keep in a dark cabinet for a few months, and you're good to go with the best vanilla extract you can find! I'm sure there are other things to make with it too... I've ground up some beans to make vanilla bean ice cream - but I need to work on that recipe a bit. Here in Israel, lately it's gotten hard to find vanilla beans. I know some of you out there have found them, but when they are here, the prices have gotten a bit steep - about 10 shekels per pod is the average I've been seeing. So I decided to ebay them - you've got to see this! Check out the screenshot on the left here - you can find this listing at https://ebay.to/2vIQE1C -- This listing is for approx 20 vanilla beans! They aren't the largest beans out there, but they are the same size as the ones I bought most recently locally for 8 nis per bean. So let's compare that with this listing - It comes to about 105 nis (and free shipping!) for approx 20 beans (a bit over 5 nis per bean). This is almost a 40% savings! The 3 nis per bean is not so big, but 20 beans - well, that's a 60 nis savings! 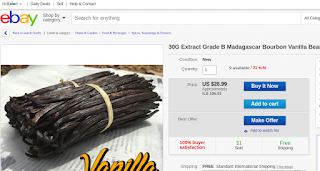 You REALLY can save big time using ebay for vanilla beans! Follow my blog for more ebay money savers for Israelis, coming soon! If you have items you love to buy on ebay, let me know at ester@kosherfrugal.com ! Summer Craziness... Shabbat is almost here AGAIN! iHerb savings and TIPS for iHerb shoppers! Great News about Subsidized Glasses! Amazing Restaurant Deals - Jerusalem/Merkaz! Museums, Water Fun, Extreme Fun, and Tons More!